All Natural, contains no preservatives and is a healthy and nutritious treat. 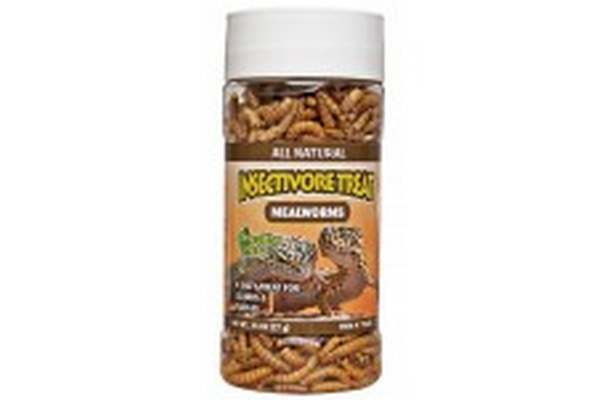 Mealworms contain collagen protein an important fiber that aids in building bone, cartilage, skin and claw structures. A good source of protein, no refrigeration and no live insects. Insectivore Treat can be used as a weekend feeder, travel food or just to have on hand for when live insects arenÕt available. Mealworms can be soaked in water and rehydrated or used to soak up medication for easy administration. This product can be used with the Healthy Herp Stepping Stone Feeding Dish with the Healthy Herp Feeding Cups.